Highlands Place is a resort-style waterfront condominium building situated between the Intracoastal and Atlantic Ocean in Highland Beach, Florida. Highlands Place boasts just 45 luxury residences in a 12-story building with exquisite views of the sparkling water, lush greenery, and tropical paradise. Residents are greeted by a gorgeously renovated lobby fit with grand marble furnishing and entrance way that leads to the 2 and 3 bedroom residences that comprise Highlands Place. The Highlands Place condo building is equipped with a doorman that allows for full-service and security to each resident. Living in Highlands Place is like a dream for residents when they lay eyes on the luxurious upgrades such as large kitchens, top of the line appliances, wood cabinets and granite countertops, marble flooring, hurricane impact windows, crown moldings, spacious master suites, walk in closets, and steam showers. 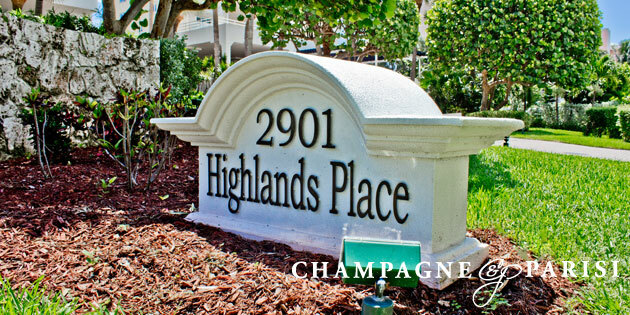 Highlands Place condos in Highland Beach range in size from 2,000 square feet to 4,000 square feet and allow for underground parking for residents. This marvelous condo building in Highlands Place provides 5-star amenities that give a true vacation feel to residents. Some of these amenities include lounge chairs on a private beach, heated oceanfront luxury pool and spa, comfortable chairs on a sundeck, covered lanai, state of the art fitness center, putting green, sauna, and racquetball court.